← You CAN Take it With You! It’s been a while since the excitement of the 4o Book Challenge began. And I HATE to say that that excitement may have weaned a little bit. Remember back when I told my class about it, and everyone was really energized by it? Ready to do it and not at all worried? And remember how my friend Brittany asked if I would do it, too, and I begrudgingly gladly accepted? Yes? Well let me update you on how it’s going. First of all, I feel like I should share with you what my kiddos are saying about it. Of course, as with any important thing in our class, it becomes a topic on our blog. I’m excited to say that the topic has come up multiple times in the “What I liked…” section of their notes for student-led conferences (yes, that is a topic I’m going to add here soon! ), and that many have WAY over half of their challenge done already! 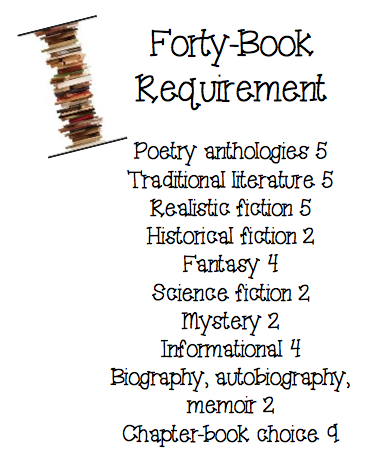 Requirements for the 40 Book Challenge, which is inspired by Donalyn Miller’s The Book Whisperer. Not surprisingly (at least to me), most kiddos started with what they know and what they love: fiction. Many of them knocked out Realistic Fiction first, then did their chapter book choice, and then tried mystery before they got a little annoyed by my list. Still, they trudged on, heading towards informational and poetry. I was noticing, though, that there has been very little traditional literature or biography/autobiography/memoir showing up in the hands of my readers lately (more on that later). What? You want to know how I’m doing with the 40 Book Challenge? Me? Well…. I’m gonna be really honest with you that I have not been doing my part to keep up with the 40 Book Challenge like I’d hoped and like I’d expected. I think I am probably at 5 or 6. I know, right??? YUCK! I have had very good intentions, and I truly believe in the importance of showing my reading life to my students, but like I mentioned earlier, I’m having a hard time finding prioritizing time to make it happen. There always seems to be something else to do, you know?! But I WANT to make it happen (I really feel like I’m letting my friends down! ), and since I don’t make resolutions, I guess it’s time to make a goal and a plan to achieve it. And I’d love your help! Posted on January 29, 2014 by Jen Bearden	• This entry was posted in Classroom, Reading and tagged 40 Book Challenge, books, reading, time, torn. Bookmark the permalink. I’m way behind as well, although I tried to keep up with my Mock Newbery Club and my Mark Twain Breakfast Club. I suspect if I had time to read Donalyn Miller’s Reading in the Wild, I might find a way to salvage my reading year. I loved her first book, The Book Whisperer. I’m way behind with my reading as well, although I did try to keep up with my Mock Newbery Club reading and my Mark Twain Breakfast Club. I suspect that if I could squeeze it in, I need to read Donalyn Miller’s Reading in the Wild. I got so much out of her first book. I take time each night to read at least 15 minutes. My two are in bed, my wife on the computer and my iPhone turned to do not disturb. This allows me to get into the book each night. Plus, it unplugs me from the outside world.